ByteScout has launched new web apps, very simple, smooth and quick-to-use! Start using this free invoice software online by submitting all necessary information about the billing: invoice destination and who made it, date, country and region, payment terms, due date and the total amount of the invoice payment. The tool can calculate taxes according to the country/region. The generated invoice can be saved or printed accordingly. Best free invoice app makes it very useful to get taxes ready automatically. You can specify every item with a proper description, quantity, rate and amount, add notes, terms, and conditions accordingly. This online application helps facilitate daily tasks for business and account managers by creating business invoice forms in a few clicks. 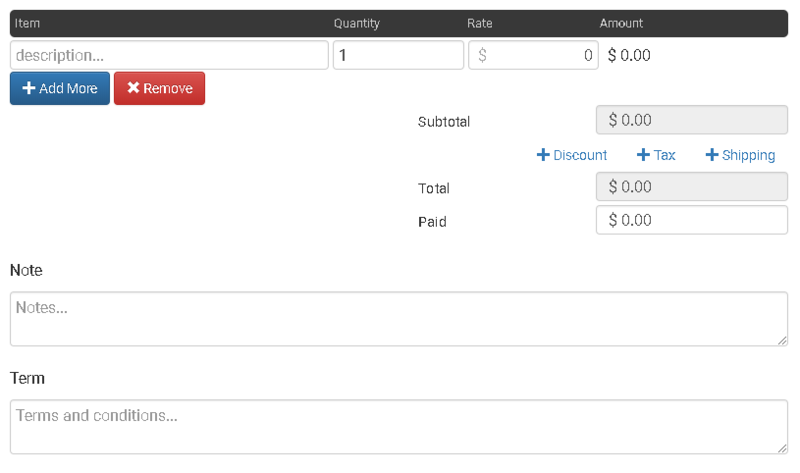 Easy invoice creator interface makes the invoice generation smooth and fast. Our free online invoice generator is a fast, simple and efficient method for invoice processing and creation. The generator requires no extra downloads or software, just a steady internet connection to avoid delays. Learn how to correctly elaborate many types of invoices for commercial, professional or personal use. Create and manage invoices with ByteScout invoice generator. An invoice is also referred to as a bill or tab. It is a document that is typically issued by a seller to a buyer. Invoices acknowledge all products, quantities, and prices for products or services rendered to the buyer in a neat and detailed format. Some invoices may also include any payment terms, as well as any conditions established upon purchase. They can be issued via printed paper or electronically, but both methods retain formality and validity. What does an invoice contain? The type of data imprinted on invoices may vary but most will exhibit a combination of the following information: a unique reference number, date of sale or purchase, detailed breakdown of prices (including all taxes), product or service description in detail, name and contact details of buyer and seller, any established payment or credit terms, and tax or company registration details if relevant. The order of the information is irrelevant though standard invoices follow a typical format. ByteScout’s online invoice template gives you complete flexibility towards the information that you wish to generate on your invoices. It makes creating invoices for your business or personal records simple and free, but also as a learning opportunity. What types of invoices are there? Various types of invoices exist to meet a variety of needs including the Proforma, credit memo, debit memo, self-billing invoice, timesheet, and evaluated receipt settlement are just a few examples. The most commonly used invoice throughout the world is the commercial invoice. Thanks to technological advances, the majority of invoices are also being issued and created electronically, skipping the whole paper processing step. Most electronic invoices will contain an embedded code or mark for managing or referencing purposes. Each country will have specific standards for any electronically issued invoice that will vary accordingly. Automation software has made invoice processing an easier and faster procedure. Nevertheless, knowing the basics of invoicing is still an essential ability for those needing to understand all invoice features and wishing to be able to reproduce them manually when required. Dive into the world of invoices and revise invoice samples with our free generator that will help you become an expert in the subject in a short amount of time. Why use ByteScout’s Online Invoice Generator? Invoices allow businesses to keep track of sales, maintain an updated and accurate registration of both income and expenditures from purchases or services rendered or received, and serve as an electronic client or worker database with relevant information at hand. Invoice formats are customizable and will provide you with a better outreach and organization for your business. Let ByteScout’s online free invoice generator lead you to the path of systematic organization and efficiency.